Banya Bashi Mosque, Molla Efendi or Kadi Seyfullah Mosque are all names of the only functioning mosque in Sofia. Once there used to be 70 mosques in Sofia, today though this is the only one left. A Muslim temple, a sightseeing Sofia, the mosque had been initiated and sponsored by the kadi of Sofia at that time. That was Kadi Seyfullah Efendi. The mosque had been built in memory of his dead wife. Up to the Liberation of Bulgaria from the Ottoman rule (1878), centre of Sofia used to be Banya Bashi Square. All the main streets got together there. There used to be the carsi (the shopping street) and the Mineral Baths. There was a fountain, stalls. Even there used to be a pavillion where they would give free cold mineral water for drinking. On the square one could see the graves of two notable donors of Sofia, Emin Dede and Molla Seyfullah Efendi. The first decades after the Liberation were marked with the destroying of many mosques and churches. Banya Basi Mosque survives in the name of religous tolerance. However, it looks its valuableness had never been estimated properly. And the mosque has a great value because it was built by the architect and civil engineer Mimar Sinan. He was one of the genious architects in the world. Sightseeing Sofia, Banya Bashi Mosque’s construction was completed in 1566. It has four domes in the middle of which there is a single minaret. The walls of the mosque were made of stone and When one enters Banya Bashi Mosque, one goes through a beautifully built arcade supported by three stone pillars, which support three domes covered in lead. The central room has the shape of a cube with a semi-spherical dome supported and designed from outside with half-archs. The dome is a universal architectural way to embody the sky. Its main purpose is when one enters that room under it, to be able to feel Good; and get closer to Him. The article above has been taken from http://sofia.privatetours.info. 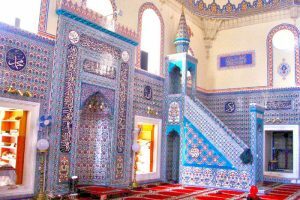 To read more, please click on the following link Banya Bashi Mosque Sightseeing Sofia.